Son of the late Angus and Isabella Macaulay, of 25, Callanish, Stornoway, Scotland. Interred: Railway Dugouts Burial Ground, grave VI. C. 13. Donald appears in the 1901 census at 25 Callanish, aged 10, the son of Angus (67) and Bella (49), and brother of Murdo (24), Angus (17), Maggie (15) and Kenneth. 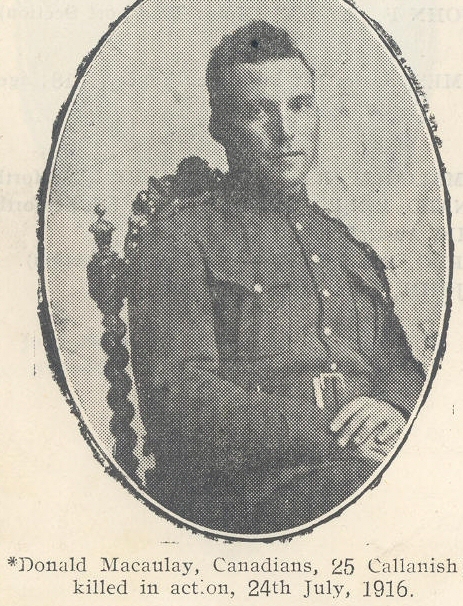 His brother John also served with the Canadians, and was awarded the Croix de Guerre for devotion to duty. His brothers Kenneth and Angus were in the Seaforth Highlanders. These three survived the war.